All transactions are safe and secure with a reliable history in online purchasing behind each of our associates. 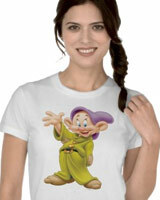 Buy the Dopey t-shirt to own Snow White clothing and merchandise. My favorite of the seven dwarfs is Dopey. I love that he doesn't have to say a word to express himself. A lot of people are all talk and he proves that actions speak louder than words. If his personality charmed you then snag your Disney Dopey t-shirt to let people know. If another dwarf stole your heart, then check out the other Seven Dwarfs shirts we offer like the Grumpy t-shirt below. In addition to the Dopey tee above, browse the Snow White Clothing Gallery for more apparel like men's and women's clothes, kids shirts or hoodies.